The Grand Hotel in Nuwara Eliya is already receiving orders and positive feedback for ‘Marry Me’, the Rs.3.8 million dessert, Chef Viraj Jayaratne told Daily Mirror. Chef Jayaratne, who created the dessert, told Daily Mirror that many Sri Lankans living abroad had praised the efforts of the team of chefs at the Grand Hotel to promote the hotel and Sri Lanka. He said the dessert was the result of a joint effort made by the hotel's chefs, the General Manager and other staff members. Mr. Jayaratne said the concept was to promote Sri Lanka and the Grand Hotel in an era where hotels were mushrooming. “Our hotel is one of the oldest in the country. The General Manager came up with the concept to grab the world’s attention and to promote tourism in Nuwara Eliya. This is why we decided to invite star cricketer Kumar Sangakkara because he has done so much to promote Sri Lanka. There have been desserts in the past but nothing like this,” he said. 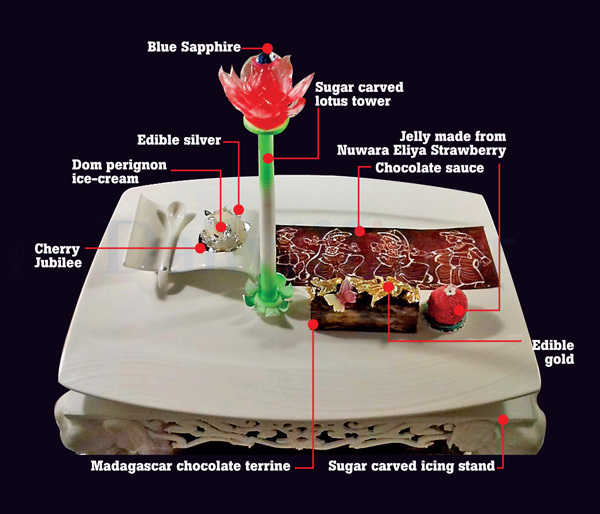 Chef Jayaratne said the dessert was not a simple piece of chocolate but rather a number of add-ons and acute traditional carvings made using rare and expensive ingredients. “The basis of the main dessert was ‘Madagascar chocolate’ imported from France. A pistachio sauce and a jelly made from fine Nuwara Eliya strawberry. We made an ice cream from French Champagne, Dom Pérignon. This champagne was also served to the guests. Chocolate sauce was served in the form of Kandyan dancers and it was made using a pin. 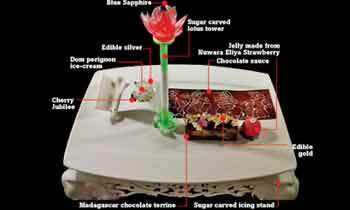 A replica of the lotus tower, one of the upcoming icons of the country, was created purely from moulded sugar,” he said. The dessert comes with a naturally untreated or non irradiated blue sapphire, one of the rarest and expensive gems, found in Sri Lanka. The gem, he said, was certified by the Gem and Jewellery Authority of Sri Lanka as well as the gem certification authority of England. The gem was placed on top of the lotus tower. “All these ingredients together completed the dessert which was served on a stand purely made out of parchment icing. The stand embodied with carvings which depict our heritage. Using parchment icing to create the stand made the task more challenging. At the end, no one can name a price on the effort put by the team and on the creativity. It took us seven days to put this dessert together. 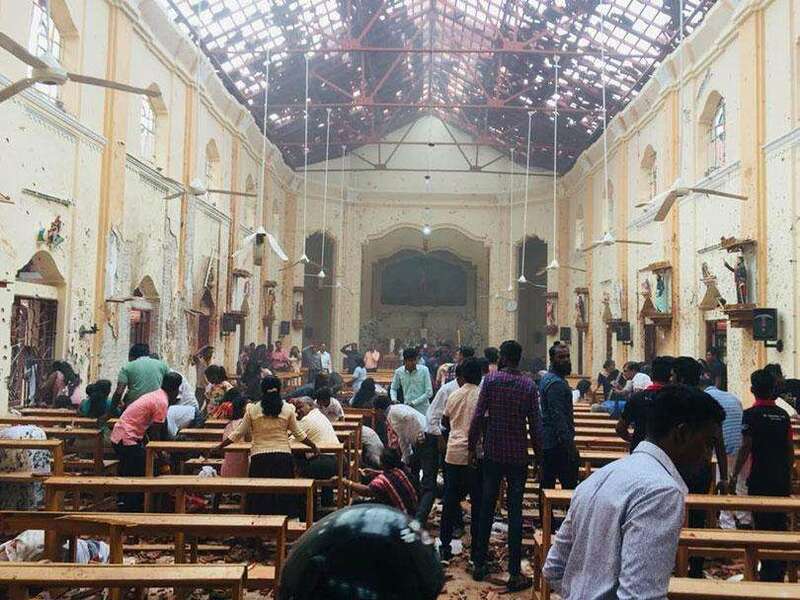 However, we are now confidant enough to undertake orders with a three-day prior notice,” Chef Jayaratne said. He did admit that there were criticisms by a few apart from the positive responses. “When we weigh responses, we have more positive feedback than that of negative. Even the negative responses, which were not many, helped promote the effort, the hotel and Sri Lanka,” he said. So what goes with it. A gold and ruby macaroni and a diamond soup? Well done Grand Hotel. Creative innovations are the way to go forward be it dessert or anything else. Theres nothing wrong in ordering it if one can afford it. Keep it up. Preposterous and downright stupid when hundreds of thousands children goes hungry a day. Marketing subject must come from school grade 6 onward. The creation needs to be commended, but whoever order this is a nut. You mean that Sanga is a nut? Is the Blue Sapphire edible? This is an insult to the industry - a puerile publicity stunt given more prominence that real culinary achievements. Just be adding a sapphire an very mediocre dessert has been given this price. The media needs to be more savvy and treat it as as it is - a gimmick. You can feed thousands of starving people in Sri lanka using these Rs.3.8 mln or give shelter those who need.Rather than eating a desert. Stupid World!!!!. "Oh what times! Oh what customs!" For 3.5 million I will need the hotel as well, Kidding. These things are good for a country to move forward and will be better if it's the foreigners who buy them. Do they have the Gem Licence to sell a Blue Sapphire at the restaurant.... Lol Since when the Gem and Jewellery Authority of Sri Lanka started issuing Gem licence to restaurants. This chef and the team has created a fine work of art from cake.they able to match with the modern world of cake making and tourism promotion.my salute for you. Why cant we take this in context. This is purely a Marketing Promotional effort. The initiators should be commended. Yes there are hungry children, Grand Hotel didn't create Hunger. Like frogs in the well, we are good at criticizing in this "Land Like No Other"
Reading some responsess,lankans are mostly negative minded jealousy fools.still their minds are in jungles. Dear ceylon, this is not negativity. When you publicize something as this desert they should be open for critics to comment. People are being negative mostly on the fact that this desert has been promoted as an expensive or unique desert., but there is no culinary skill or uniqueness in it. The value comes from the gem. Is it an achievement for a chef to publicize? Is that gem can eat and has any nutrition value or you created the cake to hang around the neck as pendent? Why no one care about the starving people? This world is so selfish. Oh so scared to even eat a slice of it. Might hit a diamond, no ? Can we have it without sapphire for lesser price ? Otherwise I may need to hire a security transport vehicle to carry it to Colombo. I don’t have an appetite to eat a stone.